Fighting games have had a resurgence of popularity in the last few years, with such recent titles as King of Fighters XII, Street Fighter IV, BlazBlue: Calamity Trigger, and the upcoming Marvel Vs. Capcom 3. Looks like the fever hasn’t stopped, with more being announced all the time. “I finally hope to reveal a bit about what I’ve been relentlessly working on lately..But there is Evo 2010 first…and I haven’t packed yet!”What will it be? A new Darkstalkers game? Maybe. Will it be Capcom vs. SNK 3? 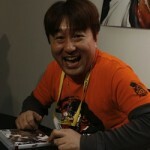 Well, while Ono has denied it, David Jaffe and his new Twisted Metal game are enough proof that people lie. As soon as anything is announced, PlayStation LifeStyle will be the first to let you know.